Charitable giving is very important to Maple City Homes and we consistently give a portion of our Sales to various charities. Pictured above at the new location for Maple City Homes, 53 St Clair St, Chatham, are Dr. Bruce Warwick, Trevor Mailloux, Rob Nelson, Kim Nelson and Gilles Michaud. 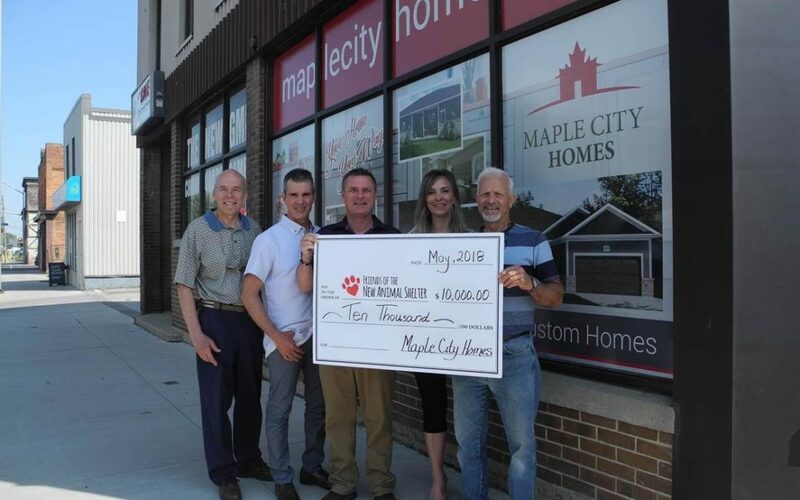 Friends of the New Animal Shelter received the first installment donation by Maple City Homes who have committed $500.00 from the sale of each home sold on Summerset Place, in Chatham Kent, to the building of the New Animal Shelter. “This is a great project and one which is of great interest to many Chatham-Kent residents. It is now time to build a New Animal Shelter that we can all be proud of. This is our way at Maple City Homes of supporting our community, our local trades and suppliers. Our challenge is for other builders in the area to do the same” the partners said. Maple City Homes will be announcing future donations shortly.